Shown in the figures, types EA, C, CD, CA, which are designed for high load capacity, are available. Types EA, C, and CD have pressed steel cages; and type CA has machined brass cages. Type EA has especially high load capacity, features low torque, and has a high-strength cage.An oil groove and holes are provided in the outer ring to supply lubricant and the bearing numbers are suffixed with E4.To use bearings with oil grooves and holes, it is recommended to provide an oil groove in the housing bore, since the depth of the groove in the bearing is limited.Spherical Roller Bearings are designed to work in applications where severe misalignment exists whether from mounting or shaft deflection and with relatively heavy radial loads and some axial loads in either direction. They are also extremely resistant to shock loads and their self-aligning feature allows full capacity loading despite shaft deflection. 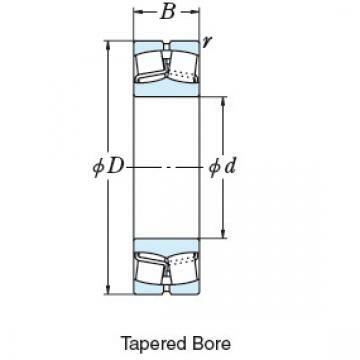 They are very similar in purpose to Self-Aligning Double Row Ball Bearings, except the Spherical Roller Bearings are designed to be more robust by carry heavier loads but at lower maximum speeds. 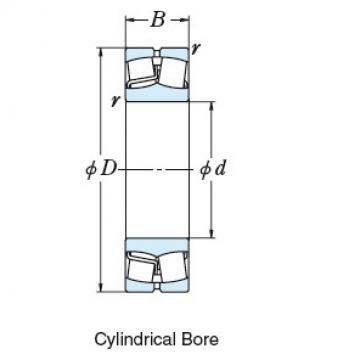 These bearings have barrel-shaped rollers between the inner ring, which has two raceways, and the outer ring which has one spherical raceway. They are self-aligning because the center of curvature of the outer ring raceway surface coincides with the bearing axis.